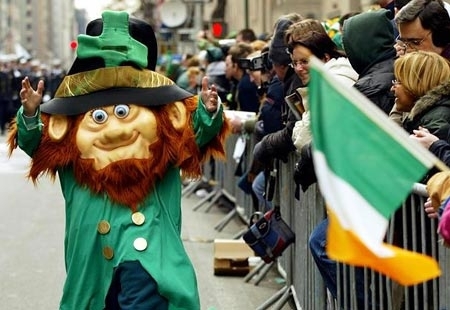 Almost every year in Chicago, it’s the same story on St. Patrick’s Day–a bunch of drunken, green-wearing slap-dicks spilling out of bars all over the city and projectile-vomiting foamy green puke on everything in sight. There is an impression that the Irish are a bunch of happy-go-lucky dipshits with fake brogues and cheery dispositions. Let us dispense with this myth right now. There is no darker heart than that of the Irish, Boyo. James Kalm slips into Williamsburg under cover of night to bring viewers a look and an extended interview with one of Chicago’s preeminent contemporary artists, Tony Fitzpatrick. Obsessively worked and fabricated from the cast off refuge of down home culture, Fitzpatrick weaves a narrative of tragic heroics recording a poetic portrait of one of the last of the great Native American leaders Crazy Horse. With simple scraps and elementary colors these collage paintings transcend their small size to express a sense of monumental mourning. Includes an extended interview with Tony Fitzpatrick. “Summer’s almost gone,” and after the “lazy, hazy crazy days,” anxiety in the art world is rising. The shake-out that began last fall is still with us. But in neighborhoods in Brooklyn, they haven’t received the memo about the sky falling. The Gowanus and Sunset Park have recently seen an influx of galleries and artists studios, many of who are displaced Williamsburgers. Under Minerva is a new space that hopefully will continue the legacy started by such venues as Pierogi 2000 in the early 90s. Stay tuned.